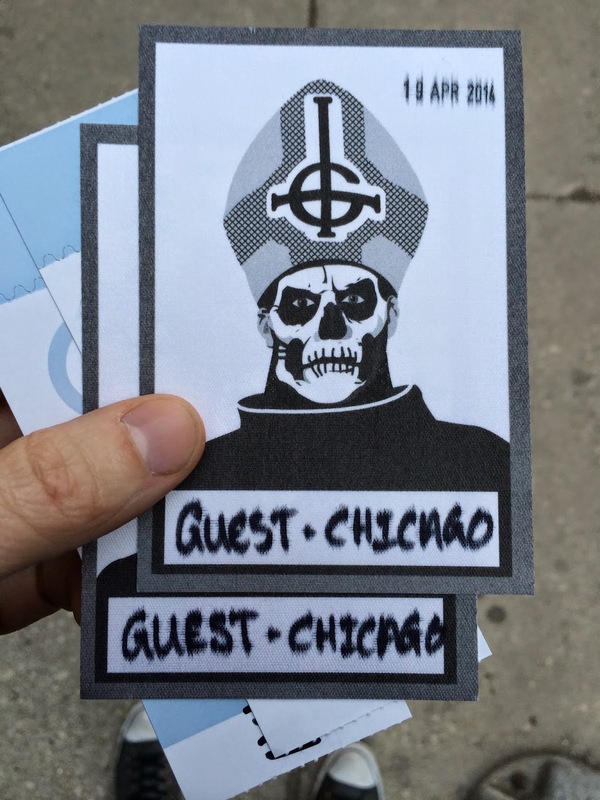 It was a pleasant surprise when Ghost announced this leg of their Year Zero tour and yet another stop in Chicago was on the itinerary. It was even more surprising when a second date in the suburbs was added for the following Monday. 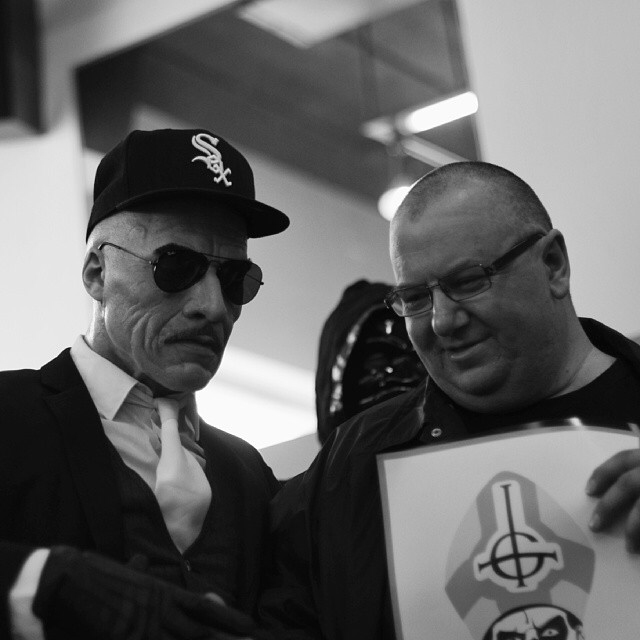 Saturday began with Ghost making an appearance at Kuma's, where Civilian Papa and the Nameless Ghouls stopped to take photos with the guys responsible for the Ghost burger (and avalanche of free publicity for the band). Saturday was also Record Store Day, so they also stopped at Reckless Records to give fans another opportunity to have their photo taken with the band. It was at Reckless that this photo was taken, proving the Sox have Satan on their side. Although it's probably still not enough to help our bullpen this season. I was a little worried that the combination of a show the night before in Pittsburgh and these relatively early public appearances would result in a sluggish performance. I also wondered if I was "over" Ghost. Tonight marked the ninth time I've seen the band since 2012, and while the love affair has never waned, sometimes bands change, performances are lackluster, and it's just time to move on. 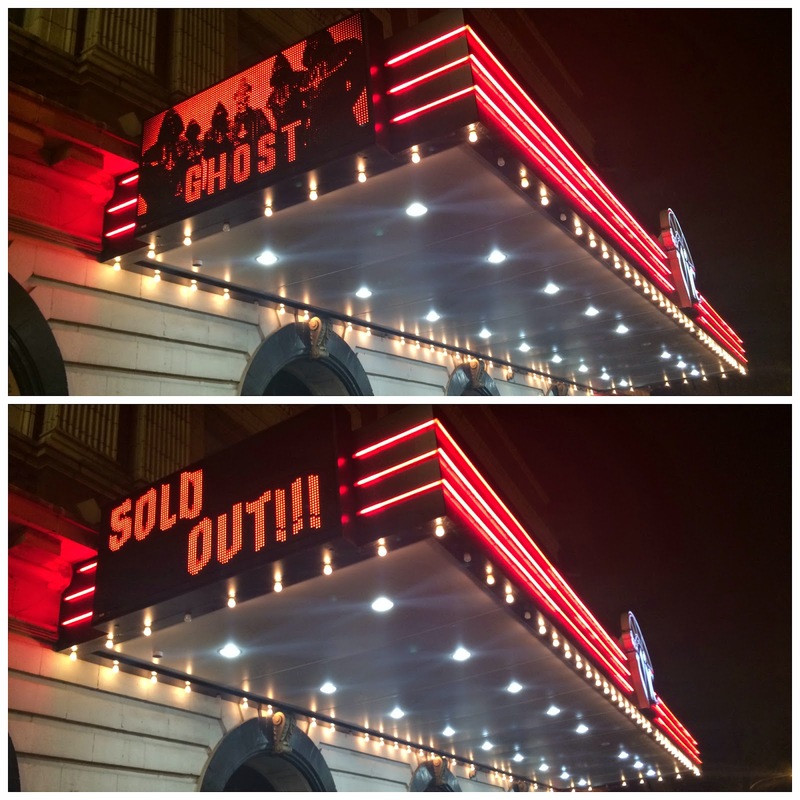 The show tonight at the 1400 person capacity Vic was sold out, making it Ghost's biggest non-Lolla show in Chicago. After a quick, drama-free Will Call experience, we made our way inside. Satan works in mysterious ways. The usual merch booths in the front lobby of The Vic weren't large enough to contain the juggernaut of Ghost Merch in 2014. Lines to buy Ghost swag were multiple and long. So long that it wasn't uncommon to see people give up waiting and leave the line. We were fortunate enough to have seats in an opera box for the show, and a weird coincidence was that the entrance to said box was guarded by a former colleague. I had only taken a quick listen to the music of King Dude before the show, and while it wasn't my usual cup of tea, it intrigued me enough to show up in time to see them live. The music is eerie and dark; with heavy Death in June influences. My girlfriend described it best: It sounds like the soundtrack to True Detective. Prior to Ghost's arrival on stage, the drummer from the Bronx (the borough, not the band) and his entourage showed up. He seemed a little upset he had to stand behind us to watch the show while we sat in front of him. Cry for the Indians.. The band took the stage and the crowd went ballistic. Papa took the stage and it was pandemonium. The band was just as great as ever, and musically, more locked in than I've ever seen them. Which was surprising given that it was only the third date of the tour. A highlight for us was watching Omega just rock out in his own world. The solemn stances of the Nameless Ghouls is a thing of the past, and it made for a much more entertaining performance. Something I found interesting was that the kids reacted far more favorably to the new songs than the old ones. "If You Have Ghosts" was a giant sing-a-long. "Year Zero" went over much bigger than "Ritual," and "Zombie Queen" was massive compared to "Elizabeth." I was happy to see the the inclusion of "Here Comes The Sun" in the set again, and so was the drummer standing behind us, who was rather emphatic about it. Ghost remains more relevant than ever, and the crowd more enthusiastic than I've ever seen for the band. Ghost returns to Joliet (!?) on Monday for another ritual. 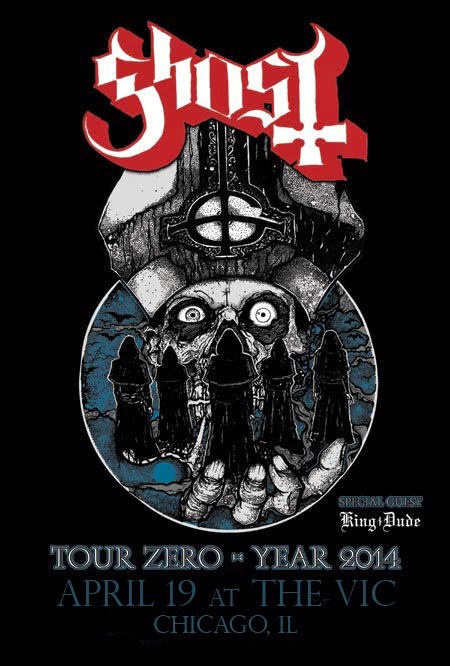 Minutia: Number of Papa II impersonators: Two. Number of Nuns: One. Number of Civilian Papa impersonators: Two.